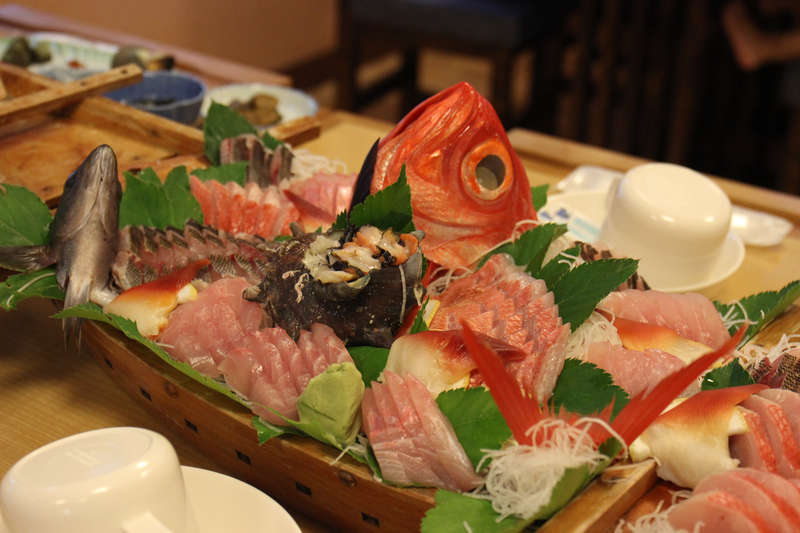 This weekend was what is known as a “sanrenkyu” in Japan, or in other words, a three-day holiday. Although the Japanese have by law 10 days paid holiday per year for just 6 months of service, increasing thereafter to 20 days, due to the extreme work culture – which, incidentally is one of the least efficient worldwide – long-suffering workers only take an average of 9 days a year. This gives national holidays a particular significance as everyone can legitimately take a bit of break. Which means that every hotel in a popular can area will be literally fully booked. Which means it is normally a terrible idea to try and book last minute. Which is something I always seem to end up doing. My friends and I fancied a break from Tokyo/Osaka city life and so chose the coastal area of Shimoda in the Izu peninsula where we heard there were some fantastic woods for walking and a dramatic coastline to be enjoyed. Only five days in advance we began our fateful hotel search, wincing at the 60,000 yen+ (~$565) price tag on the remaining rooms. 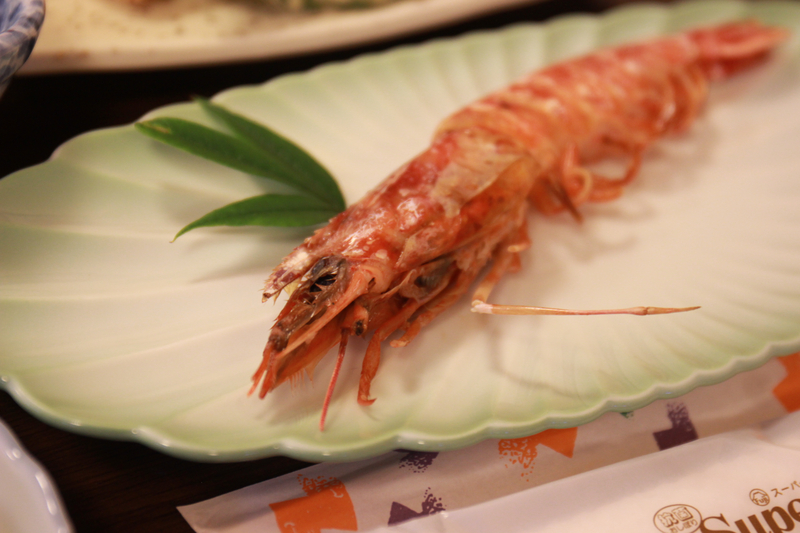 Then somehow we spotted Minshuku Baikou at 8000 yen a night. A reasonable distance from Izukyu-Shimoda station given that we didn’t have a car. Breakfast and dinner included. This was not encouraging. 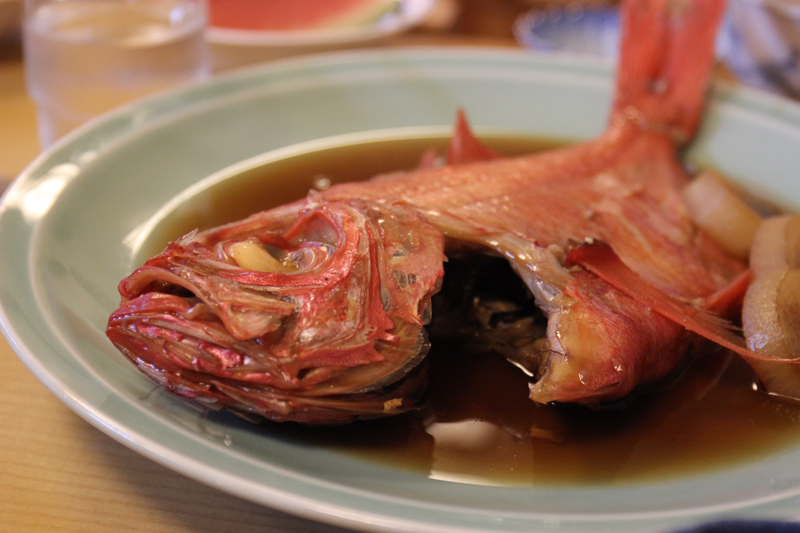 Fortunately, logistics meant that we were able to arrive in time for 6pm for some warm boiled splendid alfonsino, or kinmedai nitsuke in Japanese. So at 6pm sharp, we entered the dining room and were greeted with this scene. 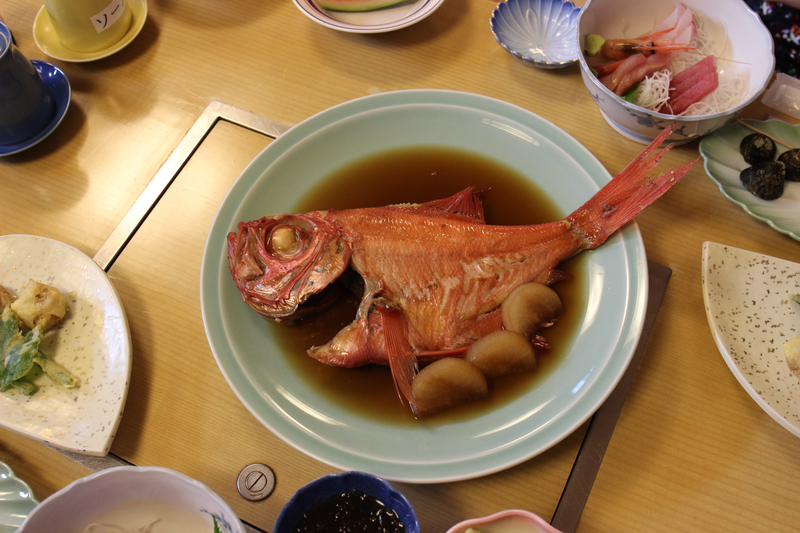 I love hotel/ryokan dining in Japan because all the little dishes make dinner into a mini-adventure. Not only had I travelled for four hours, but now my tastebuds could do a little tour too. 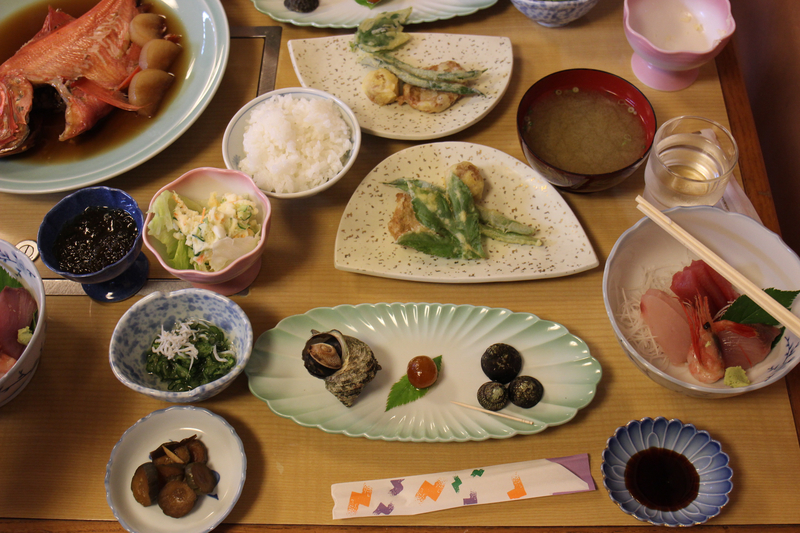 In the centre of the table was the kinmedai/splendid alpfonisno, soft, tender and singing to our senses in a sweet soy sauce, accompanied by some boiled daikon (giant white radish). 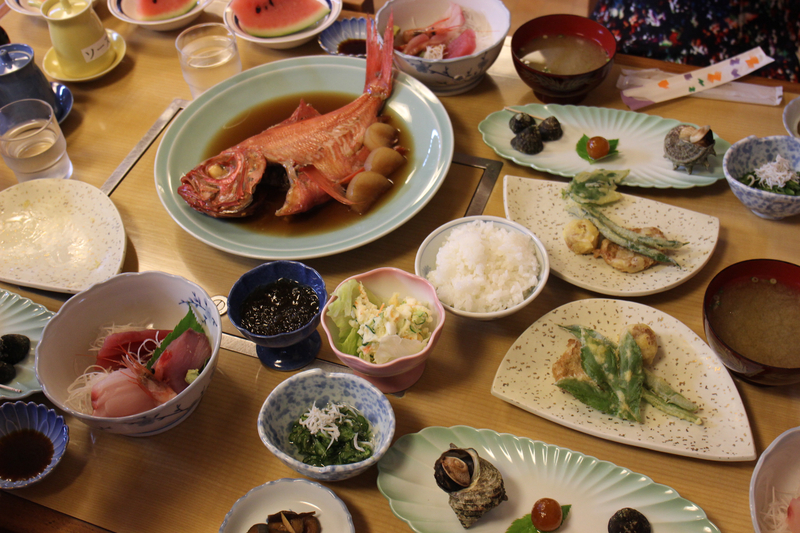 We also had some great smoky cucumber ginger pickles; a moreish cucumber, whitebait salad in a shiso sauce; some tangy mosuku, which is seaweed in a vinegar dressing; and a plain old Japanese-style potato salad. Not quite a fine dining place, the tempura was uninspiring to say the least, and I’m pretty sure the pork dumpling was fresh from the freezer. 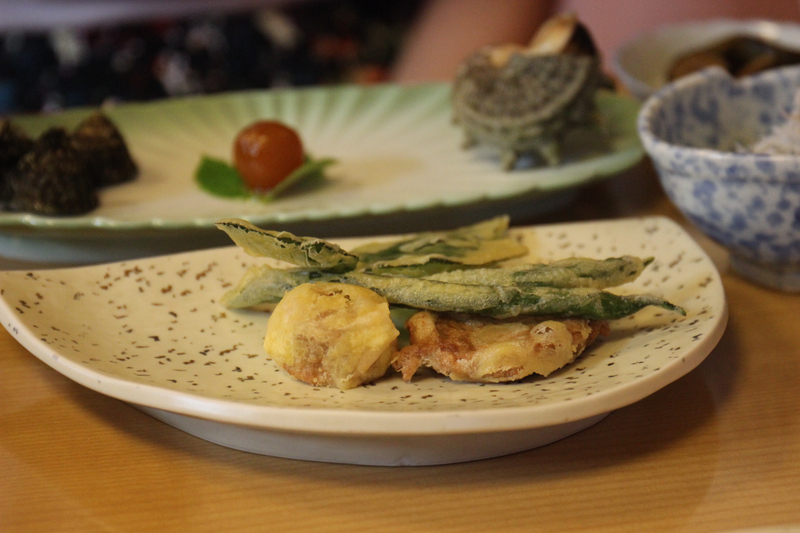 There was also a side dish that tested the limits of all of our appetites. 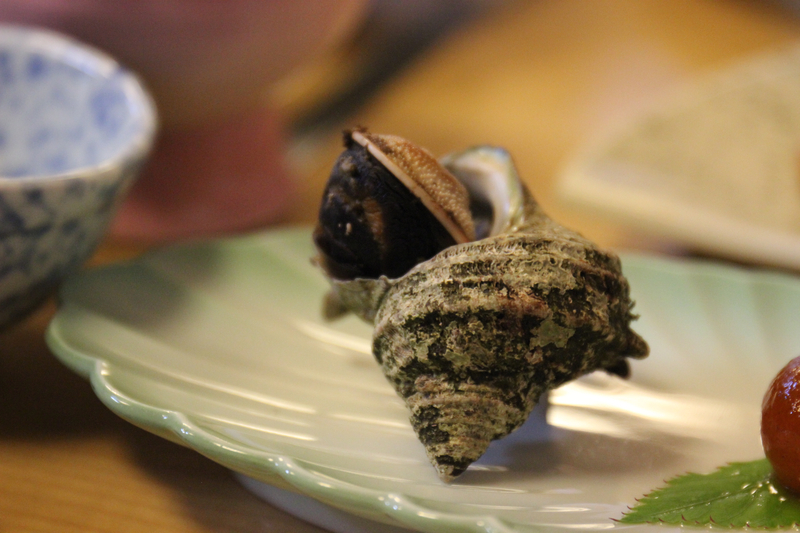 A giant sea snail was laid in front of us. Extracting it from its shell produced a smooth grey body marbled with black. Put in the mouth, it had the same smoothness and texture as a kidney. And reminded me of offal with a potent taste of the sea. Needless to say, when faced with a mammoth amount of food, it was something i decided I could legitimately not force myself to eat. The same applied to the very difficult to extract shellfish. But, the centrepiece, the semi-dried citrus fruit was simultaneously fantastically sweet and sour. We finished up with a beautiful chunk of sweet watermelon, which was light and refreshing. But not as refreshing as the open-air bath we took later that evening. We scrubbed ourselves down, then soaked in the tub, admiring the moon from behind patchy clouds. 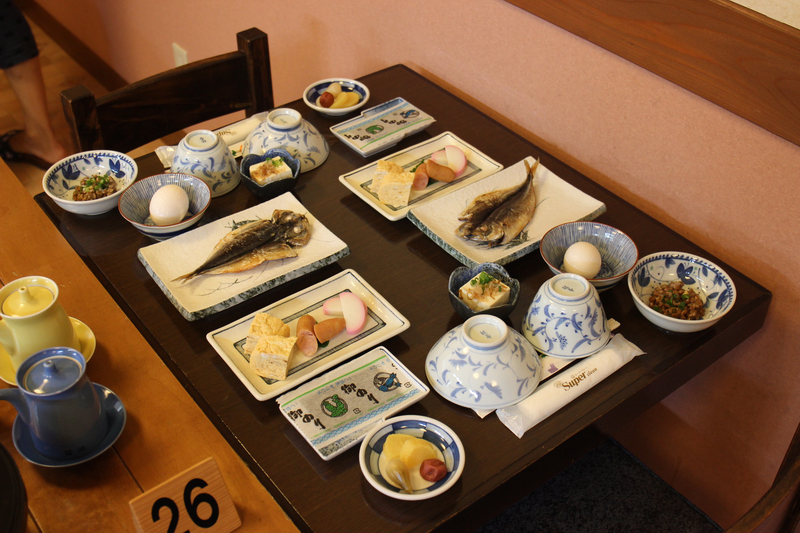 Minshuku Baikou is a place that got stuck in time, maybe about 60 years ago. The gruff man on the phone was merely old mannish rather than deliberately rude. He is clearly a man who had his ways, is very set in them, and needs to tell all the young’uns that that’s just how it’s done. When we wanted to go for a walk at night, we were strictly told to watch out for the wild boar. When we were leaving in the morning, we were told “I’m only going into your room to change the bin – don’t expect anything else.” When a mosquito accidentally got squashed on my duvet – exploding blood everywhere (yes really) – I was told “you only get one set of sheets for a two night stay” – until I explained the circumstances. Fortunately, an elderly female member of staff brought me some new sheets and some ointment for my bites, which was particularly kind. 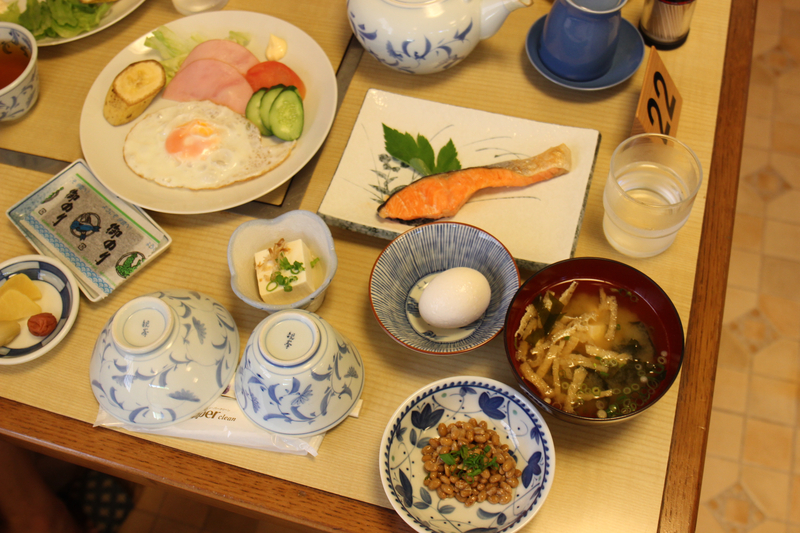 With the old-school regime firmly established, we approached our first breakfast with bets on whether there would be natto or not. 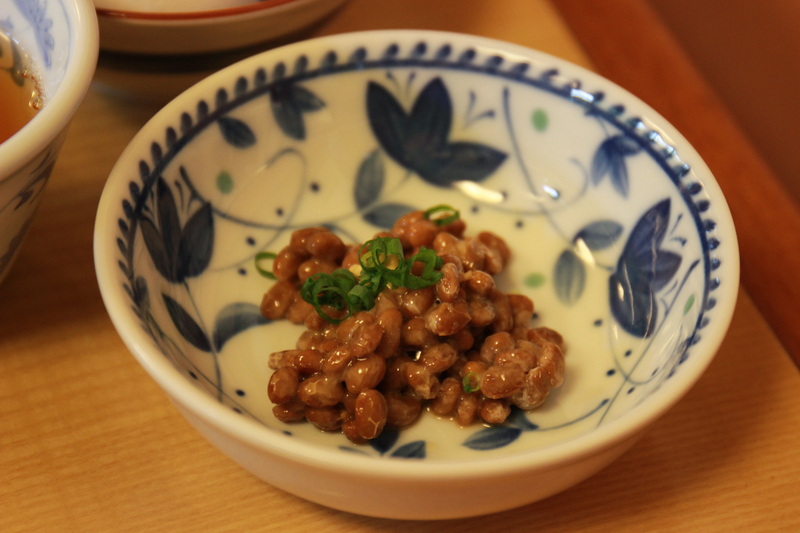 Natto is fermented soy beans with a slimy texture and pungent smell that is infamously hated by foreigners. I happen to quite like it. So when I saw it sitting next to our breakfast table the next morning, I was quite delighted. 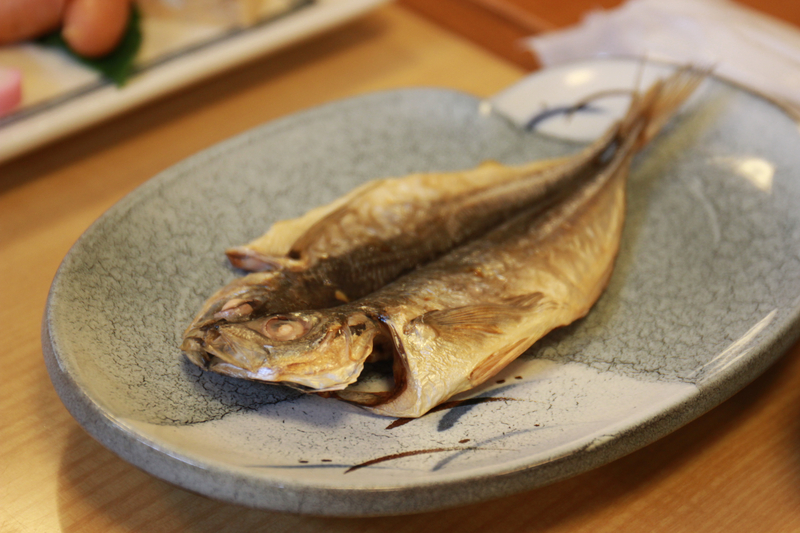 That was served long with a grilled aji (horse mackerel) – which was absolutely delicious – raw egg to be mixed with soy and poured over rice to make tamago kakegohan, tofu, pickles, a miso soup that was full of seaweed and leeks and was one of the most delicious I’ve eaten (drunk? 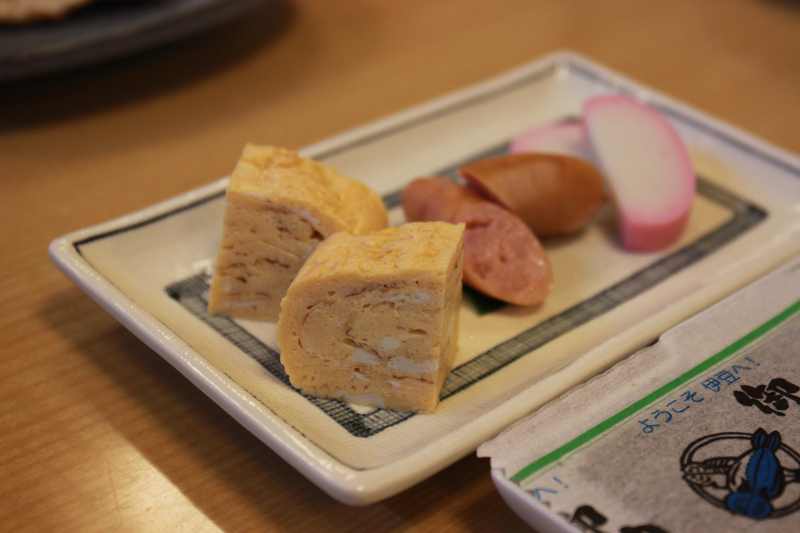 ), tamagoyaki (sweet Japanese omelette) and some rather processed looking meaty bits that I ignored. With the inflexible attitude encountered so far, albeit slightly amusing/bemusing, we decided to take bets on what was for dinner the next night. Could it be more kinmedai? Yes, it could! 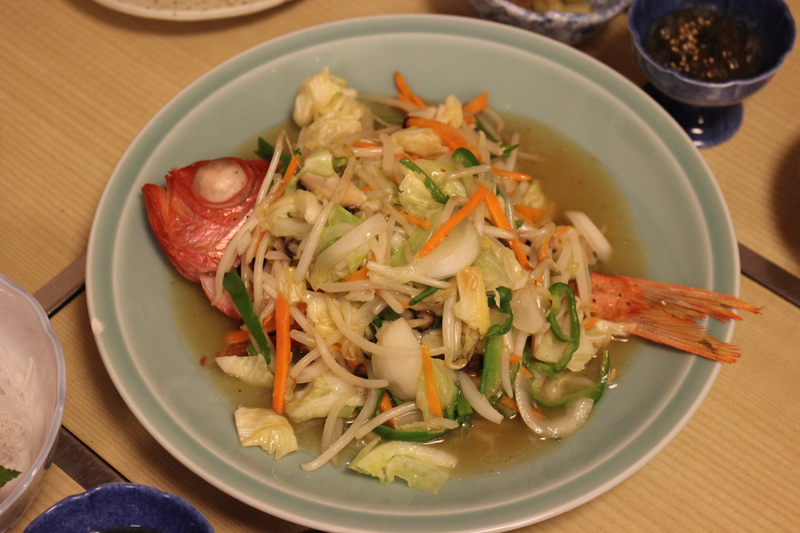 This time, it was done Chinese-style with a peppery sauce and stir-fried veggies. 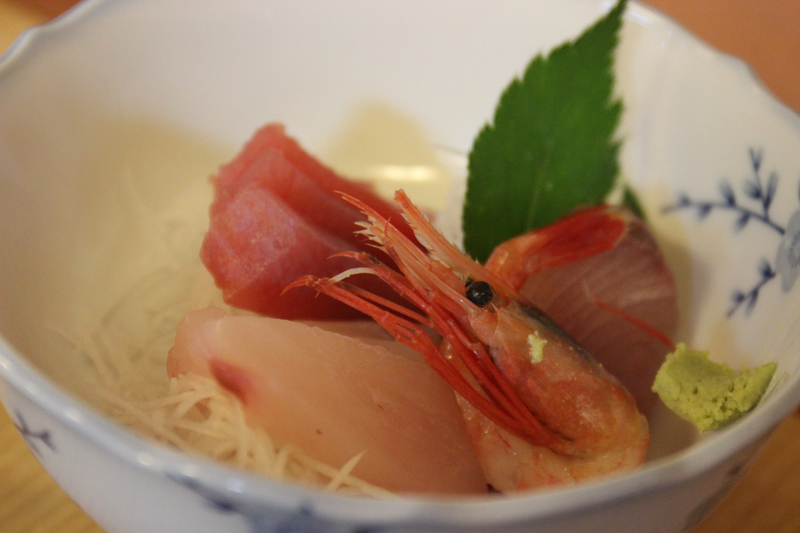 This came with a giant prawn, pickles, soup, sashimi including alfonsino, tuna, Japanese amberjack (warsa), and a kind of shellfish known as hokkegai, which was kind of rubbery but not entirely unpleasant. 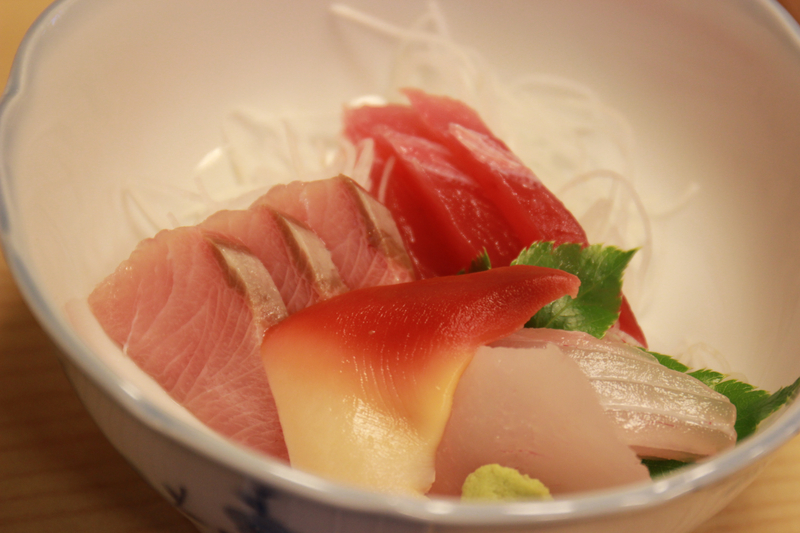 The star was the tuna, however, which had enough flavour and texture to support the soy and wasabi and make a mouthful of umami flavour, which evolved as I swallowed. 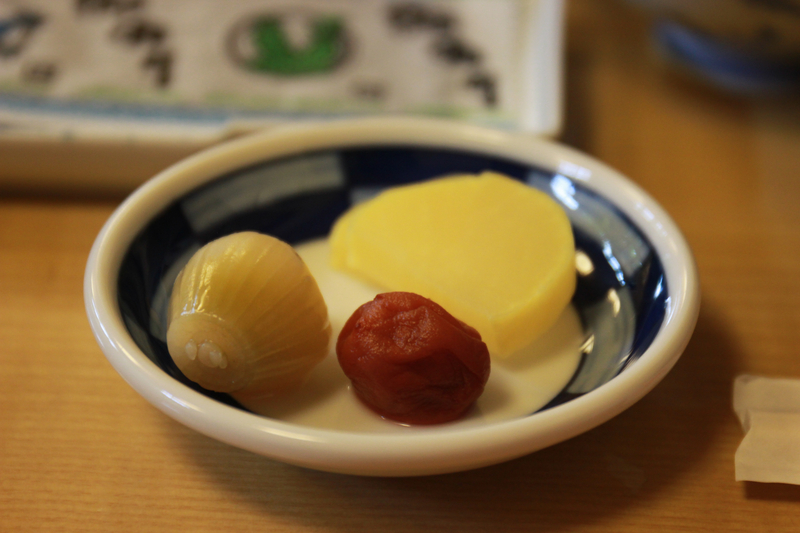 An intriguing local item were tokoroten – jelly noodles made from seaweed, which slide down very easily and satisfyingly. They are served as a kind of snack around the area, from kiosks in tourist car parks and at beaches. 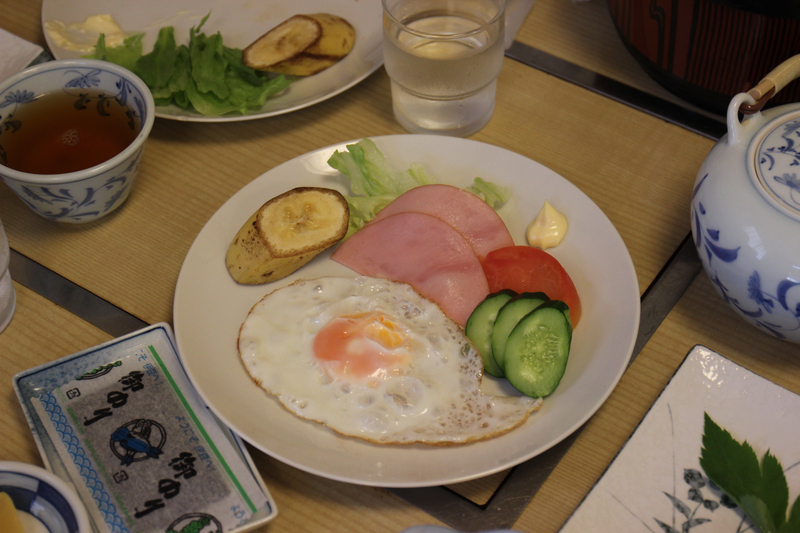 Breakfast the second day had also been shaken up a little bit, with ham, fried egg, salad and banana making an appearance. 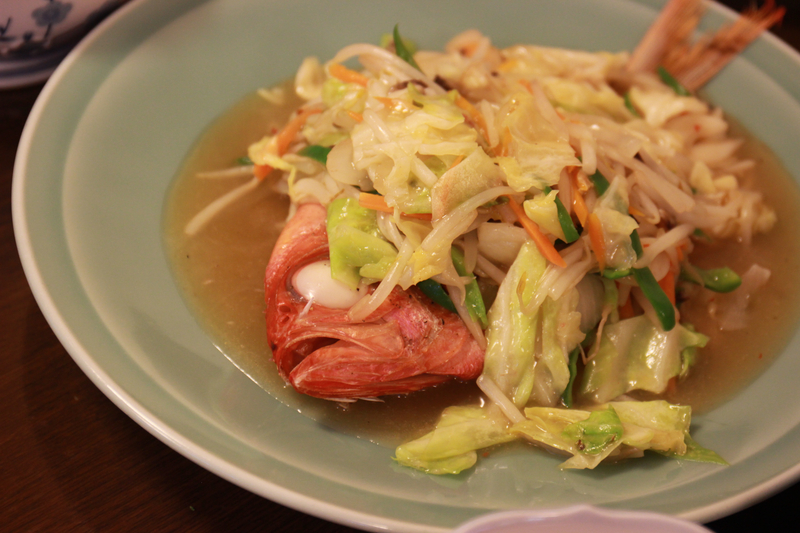 But the absolute best way for me to end my binging at Baikou was this piece of fatty, salty salmon. 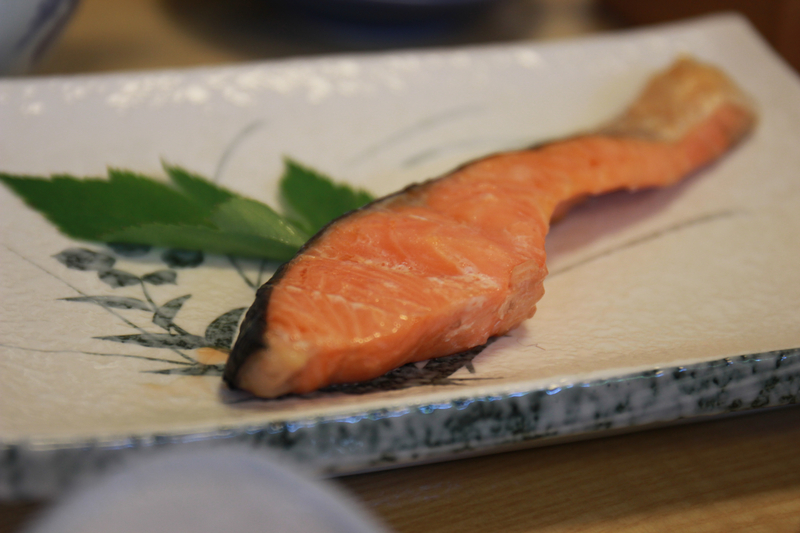 I grabbed a piece of nori (seaweed) and wrapped up a piece of salmon with some raw egg and soy-coated rice. Perfect. I’m going to have make this for myself as a weekend treat!